Help Us Keep Our Date with the Stars with a tax-deductible donation to StarDate. Our programs help keep you up to date on what's in the night sky and what's happening in the science of astronomy. But we need your help to keep our programs going. Our programs are self-supporting, paid for by magazine and radio subscriptions, merchandise sales, federal and private grants, and individual donations. But we don't need astronomical sums to keep us going. Your tax-deductible contribution of $20 or more will help us continue to bring you the latest skywatching tips and astronomy information. 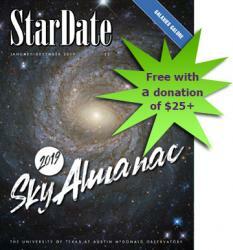 Everyone who donates will receive a downloadable copy of the 2019 Sky Almanac issue of StarDate magazine as our way of saying thanks. We appreciate your support and interest, and thank you for your help!